Taken at a produce auction in Homerville, Ohio. 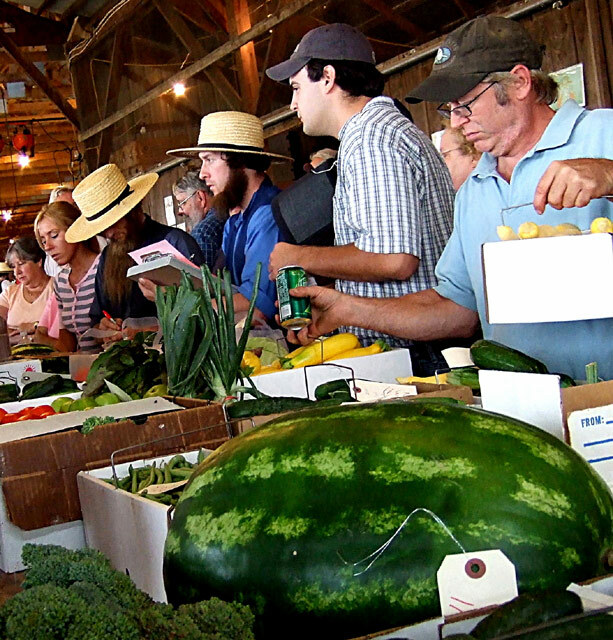 Amish bring in produce in large quantities to auction off. Very successful for them. Good exposure, but I failed to see anything triumphant. Every person looked either disgusted or confused. Great colors and detail. The slight sloping angle makes me feel like I'm pitching forward. Fail to see any connection to the challenge. Wouldn't even know it was an auction if not for the title. Could just be a farmer's market. A fascinating shot that has the feel of leaning a little to the left. But where is the "Triumph" in this shot? triumph? the winner got the watermelon? I am not trying to be fascetious, I don't see the connection here. sorry. I don't get the 'Triumph' aspect of this photo. Nice photo though. It's a nice shot, but I don't get how it relates to triumph. Because the melon is big? Interesting group of people - Like all the textures and the composition. Triumph? can't see that really. Proudly hosted by Sargasso Networks. Current Server Time: 04/21/2019 02:33:22 PM EDT.